• Avoid pancake makeup: Layered, cakey makeup is the worst thing you can to in order to look young. With your skin being less plump, your fine lines and crow’s feet might just get more defined if you go the foundation, concealer highlighter route. Instead, choose a nice cream-based foundation or a face tint that will bring out a natural glow. They are known for their creamy textures, easy application and the natural glow they give the skin. • Get moving: Regular exercise is what will keep you looking young from inside and out. Exercise is very important to keep your joints and muscles in shape. Include some light and easy exercises like walking in the mornings or yoga to keep yourself supple. Try the Daily Yoga app for a guide to the asanas that suit you. 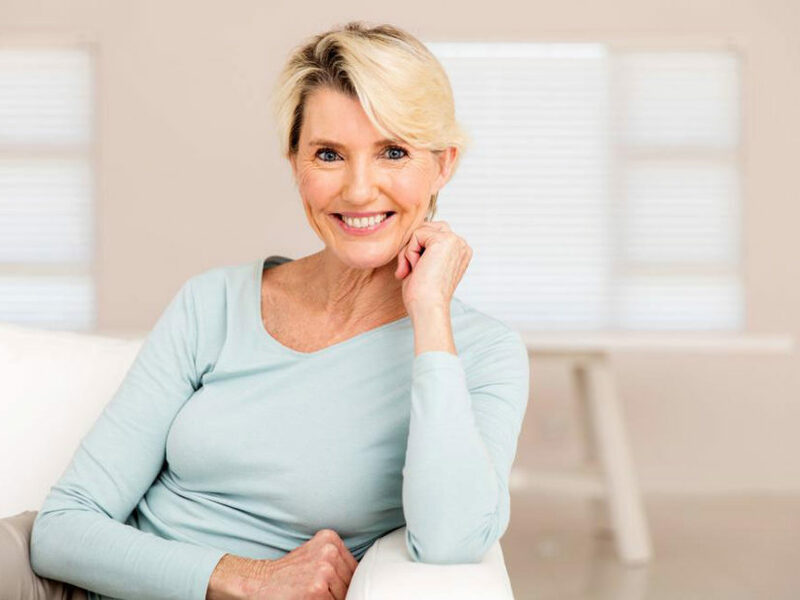 • Positive attitude: As you age, you could be facing mood swings due to many things like menopause, children moving on or coming to terms with your friends moving closer to their children. Put in an effort to maintain a positive attitude and embrace the changes life brings with a new zeal. Get the help of an app like Calm to download meditations sessions and be on your path to nirvana! • Embrace the grey: It is no longer mandatory to color your hair as you grow older. In fact, it is simply awesome to rock your silver strands with pride! Embrace your grey hair, maybe even get a complementing cut so that they are highlighted correctly. If you are not yet assured of sporting grey hair, opt for highlights in a shade or two lighter than your original hair color and gradually leave out on touch ups. • Dress gracefully: If you’ve had a signature style till now, don’t completely give it up. Instead, make a few changes – like opting for a mini skirt in neutral shade, opting for straight-fit trousers or palazzos instead of cigarette pants, or reducing the flare of your bell sleeves. However, whatever you choose to wear, carry it off with a big smile and a confident stride. Don’t hide in dowdy ill-fitting skirts or pantsuits just because of your age. However, don’t forget classics such as cashmere sweater, skirts and well-fitted denims. • Anti-Wrinkle Creams: Go the distance by making it a habit to include some best wrinkle creams or an anti-aging cream suited for your skin. However, the most important aspect is getting enough rest. As you grow older, your body needs more zzz’s. It not only helps manage stress but also helps improve your memory. So, give your mind and body the down time it needs and make it a habit to get into bed early and take to a relaxing activity like reading in bed (You might as well as be looking up the best anti-wrinkle creams!) or chatting with your partner or just listening to some songs before nodding off.